Organized warfare has been part of human history for thousands of years. Over time advances in offensive weapons gave rise to advances in defensive measures. Times of crisis often led to a speeding up of such changes. One of those times were the Crusades. At the time I am writing this, the Houston Museum of Natural Science is hosting Knights, an exhibit on arms and armor from the Stibbert Museum in Florence, Italy. One aspect of the world of knights – castles – is not easy to display within the walls of a museum. 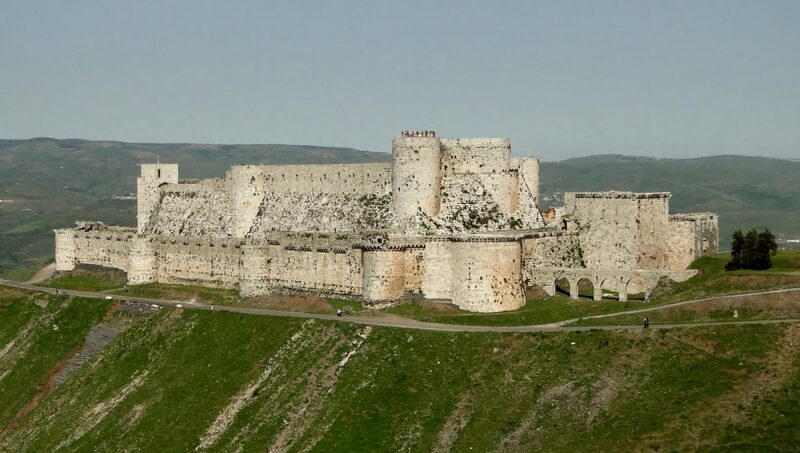 In this blog entry, I want to expand on the history of one particular castle: the Krak des Chevaliers in modern Syria, close to the border with Lebanon. The site of the castle was first occupied in the 11th century by Kurdish troops garrisoned there by the Mirdasids. Because of its first occupants, it was known as Hisn al-Akrad, or “Castle of the Kurds.” In 1142 the Knights Hospitallers took possession of it and held it until 1271, when it was conquered by Mamluk forces. Initially, the castle was known as the Crac de l’Ospital; the name Krak des Chevaliers was coined in the 19th century. Castles such as the Krak des Chevaliers symbolize attempts to safeguard access to the Holy Land at a time when the Byzantine Empire had retreated from the area. With Muslim dominion over cities like Jerusalem, the Crusades were undertaken to re-establish western control. With the exception of the First Crusade, these attempts proved futile and the dream of controlling Jerusalem once again remained exactly that. 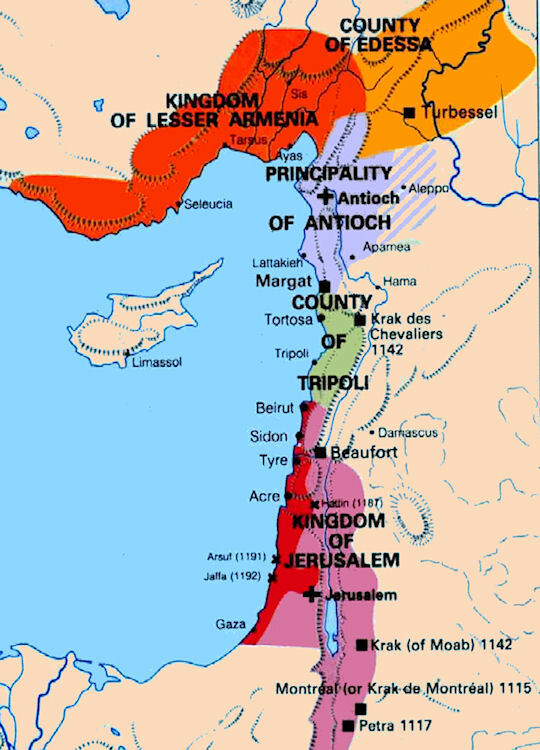 Map showing the location of the Crusader States, including the location of the Krak des Chevaliers. After taking possession of the castle, the Hospitallers began to modify it, a process that started in the early 1140s and finished by 1170. By that time, the order controlled a number of castles along the border of the County of Tripoli, a state founded after the First Crusade. The Krak des Chevaliers was among their most important strongholds. It acted as a center of administration as well as a military base. After a second construction phase in the 13th century, the Krak des Chevaliers took on its current appearance. It embodies many of the defensive features that arose because of an uptick in siege warfare that characterized that period. The most dramatic and expensive change in castle architecture came in the early decades of the 13th century, in response to a large-scale adoption of powerful counterweight trebuchets. Counterweight trebuchets at Château de Castelnaud. Source: Wikimedia Commons. 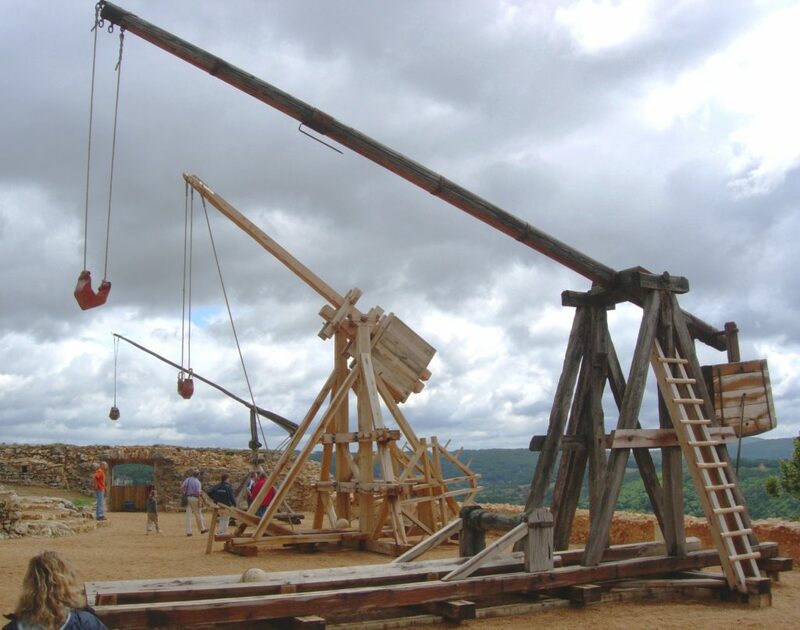 Counterweight trebuchets initially made their greatest impact in defense rather than attack, as a counter-battery weapon that was most effective when mounted on top of a tower. This led to the development of larger, broader and deeper towers, serving as artillery emplacements. Some fortresses incorporated such ‘great tower(s)’ on their most vulnerable side, to assist in keeping the enemy at bay. 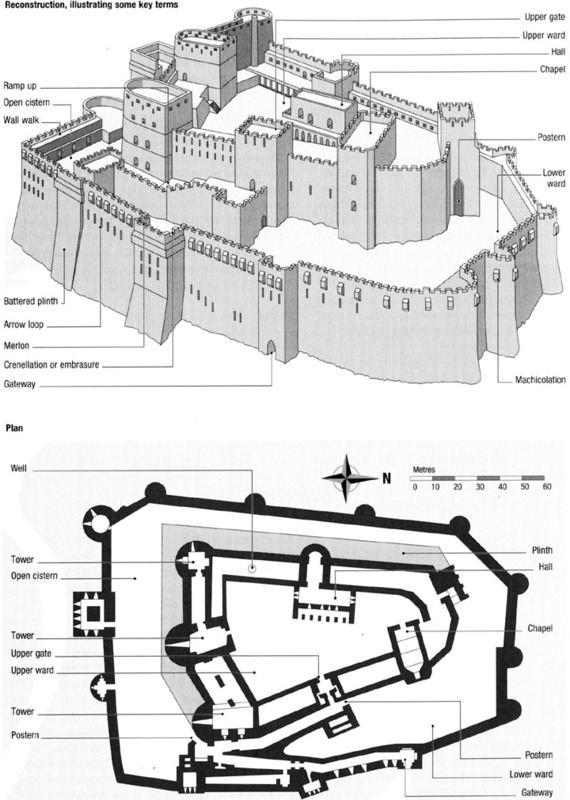 Another important development was a multiplication of existing defensive features, including doubled walls, more towers and an abundance of embrasures in the walls. Tiers of superimposed defensive galleries with loopholes were installed, along with various forms of projecting machicolations. Example of a defensive feature known as a machicolation. Source: Wikimedia Commons. 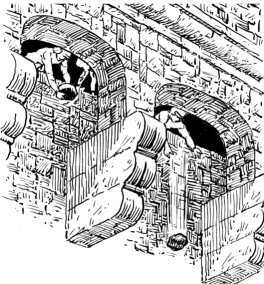 Artist rendering, showing defenders using the machicolations in their castle to drop rocks on the enemy. While greater efforts were made to use naturally defensive features, walls also became thicker. Ancient columns were often laid horizontally through such walls, binding their inner and outer layers together. There was increasing use of the talus, or sloping additional base along the outer foot of a wall. This feature was intended to make it harder to breach a wall. Castles featured circular towers projecting from the curtain walls, a Crusader invention (later applied by Richard the Lionheart at Gaillard Castle). 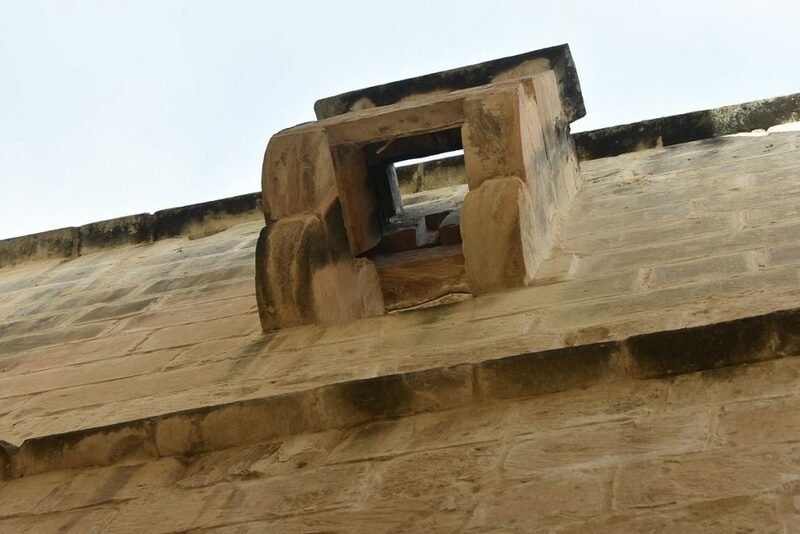 With arrow slits covering all angles, defenders in the towers could thwart any attempts at scaling the walls with ladders. Another technique used by the Crusaders’ architects was to smooth the sides of rock summit on which the castle was built to deny hand- or footholds to anyone attempting to scale the walls. The gateway into the Krak des Chevaliers was a complicated affair. It rose between two gates by means of broad shallow steps which presented no difficulty to men or horses approaching slowly. However, it could not be taken at speed. Three consecutive changes in direction, one hairpin bend, would slow an enemy fighting his way in, while rapid changes in lighting levels (from bright sunlight to dark shadows) added to the confusion. The presence of “murder holes” in the ceiling also meant that any attacker was subject to overhead attack. 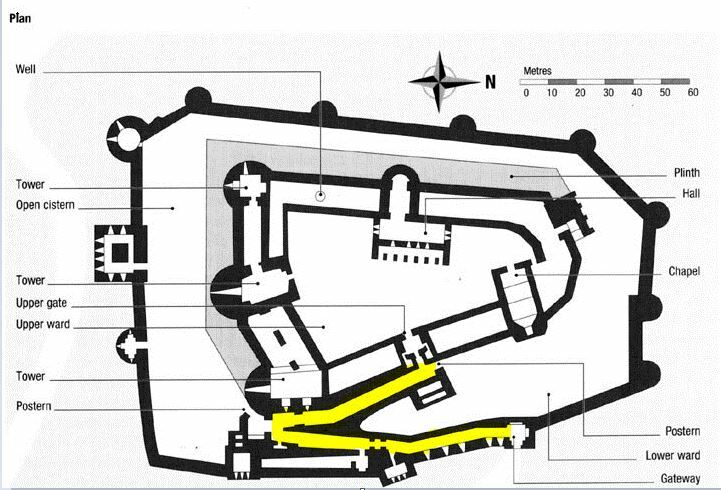 Bent entrance (highlighted in yellow) at the Krak des Chevaliers. 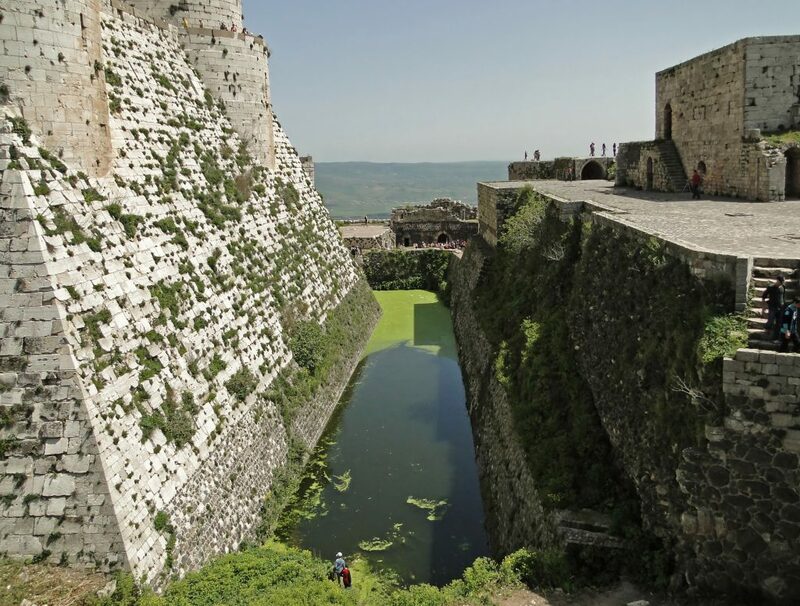 One of the most remarkable features inside the castle of Krak des Chevaliers is an open cistern, or short moat, between the extremely strong southern outer wall, and the even larger southern glacis of the inner citadel. In addition to serving as a secure source of water, its existence may have inhibited mining operations against the vulnerable southern side of the castle. Short moat (or cistern) located on the south side of the castle. The death of King Louis IX of France in 1270 heralded the end of the Hospitallers’ tenure at the castle. On 3 March 1271, Mamluk Sultan Baibar started to besiege the Krak des Chevaliers. After the outer works had been taken, and the defenders had retreated to the inner citadel, a ruse was used to bring the siege to an end. The besiegers conveyed a letter to the garrison, allegedly from the Grand Master of the Knights Hospitaller in Tripoli which granted permission for them to surrender. Although the letter was a forgery, the garrison capitulated and the Sultan spared their lives. The castle has survived until today, sustaining substantial damage during the recent violence in Syria.